Mexico is one of the best possible destinations for US travelers as it is close, affordable and full of beautiful places. 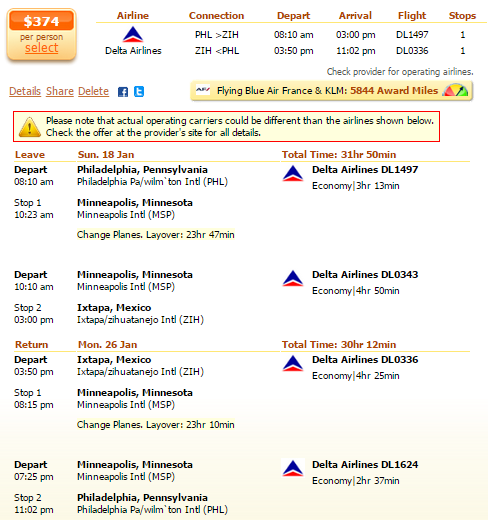 Check out the Ixtapa flight from Philadelphia our deal hunters have just found for $374 r/t with taxes included and see that if you book this Delta Airlines airfare deal you can save as much as $290 compared to the next best fare out there. This cheap flight to Mexico can be booked both on FlyFar and FlightNetwork, but we have found it on Travelgrove. If you want to make sure that you have the best Philadelphia to Ixtapa aifare deal you should compare the prices of more merchants from the box. The departing flight starts on January 18 from Philadelphia International Airport (PHL). It is in total 31 hours 50 minutes long and has got one stop in Minneapolis. The return flight starts on January 26 and it is 30 hours 12 minutes long – and with a Minneapolis stop included. Those who book this flight with Delta will get 5,844 award miles from Flying Blue Air France and KLM. While the Delta Airlines flight costs $374 r/t, the next best deal found for the Philadelphia to Ixtapa route costs $664 r/t. This entry was posted on Monday, January 5th, 2015 at 2:25 am and is filed under Airfare Deals. You can follow any responses to this entry through the RSS 2.0 feed. You can leave a response, or trackback from your own site.